Meet our site mascot - Oscar, the Bionic cat. 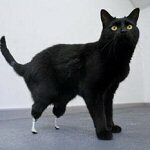 Learn more about the world's first Bionic cat here. This site/fan club is not sanctioned or authorised by Lee Majors in any way. No copyright infringement is intended of either television and/or film companies, for the images/information used. Welcome to 'Cyborg', Lee's unofficial UK fan site. 'Cyborg' has been around in one form or another for the last 30-plus years! We started out as a 2-page typed and xerox'd fan newsletter back in the 70's and have been bringing fans Bionic and Lee-related news in one form or another ever since. 2019 sees us entering our 21st year of hosting a web site for Lee, and as always we are dedicated to bringing you the latest and best news, images and media on Lee & his career. Please take some time to explore the site. We are always open to feedback and comments on how we are doing along with anything else Lee-related that you'd like to see us cover! Follow all the latest updates on Lee and his projects over at our Bionic Tweets Twitter page! Be sure to check out the superb Six Million Dollar Man, Bionic Woman and The Fall Guy art work available from renowed UK artist Peter Wallbank at his official site here and you can also purchase it through RedBubble.